Being a somewhat arts-and-crafty minded person I have always been obsessed with the 'do it yourself' or better yet 'have someone else do it for you' kind of enterprise. One of my favorite shops on Newbury Street is Lill Studio, a bright little place filled to the brim with various handbag designs and oodles of gorgeous fabrics. The idea is that one walks into the shop, grabs whatever pretty fabrics that catch the eye (stock changes often) and picks a handbag pattern. Choose a color for the exterior of your chosen bag, piping, ribbon or handle detail as well as an interior fabric color and hand it off to the shopkeeper. 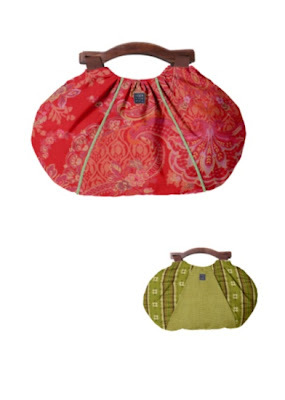 In about two weeks time your personally designed bag will be ready for pick up! 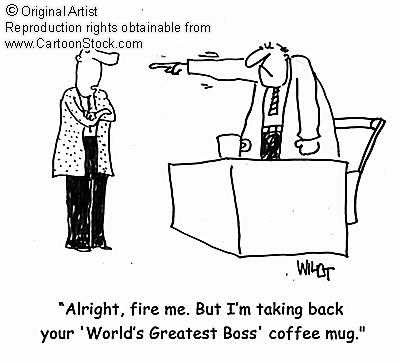 I could be stuck in the torturous world of middle management. Haven't you seen the American version of The Office? Then again, if I worked in the torturous world of middle management, I might be able to go home before 8pm on a weeknight and not feel guilty about taking off work on the weekends. Now there's a concept for the graduate mind to get around. One of my co-workers gave me a fabulous mug (only $1 at Target!) that says, "EMPLOYEE OF THE YEAR." Satire never rang so true. Aaarrrh! A pirate's hat for me! Halloween costumes are a WASTE OF MONEY. You can only wear the costume once and then it gets shoved in a closet where it collects dust for the next several months. For example, when will I ever wear a minidress made out of the British flag (well, ok, maybe I would actually wear that again...) In any case, while considering what I might like to be for Halloween (keep in mind, I am well over the acceptable trick-or-treat age!) I found something that I just couldn't resist. It was large, it had black ruffles, big red bows and dyed ostrich feathers. It was one fabulous swashbuckler's hat, and for only $22 plus shipping and handling it could be mine. Well, of course I bought it. The next morning it hit me like a bad hangover. When will I EVER wear such a hat? And more importantly, where will I store it? In desperation I tried emailing the company to cancel my order, but it was too late. A couple of days later I got a large package in the mail. One fabulous swashbuckler pirate's hat with black ruffles and ostrich feathers was now mine. Last night I was busy preparing a late-night snack when I heard a rattling at the door. There was the sound of a key being stuck into the lock, twisted back and forth, and removed. The key was then reinserted and rattled again. And again. And again. Thinking this could be my boyfriend after one too many glasses of red wine post-intellectual theory colloquium (is there such a thing?) I went and opened the door. The oddest thing about the incident is that there was never a point where the well-dressed girl ever thought it odd that a complete stranger would be in her apartment wearing such a garish fluffy bathrobe. But maybe I underestimate the power of the polka dot? A few weeks ago I suffered the sad misfortune of chomping down on the tip of my tongue while eating a very delicious platter of tagliatelle alla bolognese. Not only was I in constant searing pain as a result, but just about the only thing I could eat for a week was yogurt. If you haven't realized from reading this blog, food is just about my favorite thing on earth. Depressed and resigned to having a frustratingly dull (and painful) series of yogurt meals for the next several days I went to Whole Foods to see just how much delicious food I would not be able to eat. Lucky for me, the local Whole Foods happened to have a promotional event right outside in the parking lot. 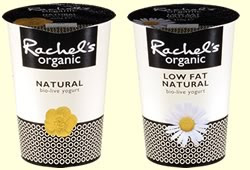 A company called rachel's was serving samples of a rich, creamy organic yogurt. On display they had a fabulous plum lavender honey option in addition to pomegranate blueberry and kiwi passionfruit. I tried all three. Rachel's associate: "So what do you think of our flavors?" Me (slurring slightly -- the gash on my tongue also impeded speech): "Theethe are THO delithious! I LOVE THEM!!!" And here is where my luck really changed for the better. The sales reps were getting ready to pack things up because it was the end of the day. They also appeared to be trying to get rid of all the excess yogurt. Rachel's associate: "If you like the yogurt, why don't you take some home with you?" My suspicious boyfriend was convinced this was a profit rouse and proceeded to point out all the things wrong with the product. It was too sweet for his (bland) palate and tasted an awful lot like dessert (which is a bad thing because...?) The sales rep was undeterred and offered me three cases of the yogurt at no charge. Ignoring the suspicious boyfriend I happily accepted and trotted off with my caloric intake for the week. I spent the next several days consuming vast quantities of this gourmet yogurt. Despite eating the same yogurt for 8 days in a row I never got tired of the flavors (they were too unique) and even now would happily head back to Whole Foods for more. Turns out Rachel's is an organic dairy company from the UK that is trying out the market in the U.S. After my troubled tongue experience I would say they have at least one supportive buyer in Boston. The owner of Christina's Spices and Christina's Ice Cream next door is one Raymond Ford, a gentleman who studied in Cambridge, England and then came to Boston to teach social theory. He eventually gave up on academia and moved onto business, taking over Christina's Ice Cream and later opening Christina's spice. Most of his clients are local restaurants so turnover is rapid and the spices are fresh. 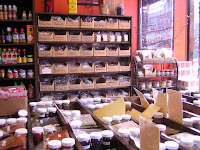 Of course, this fabulous spice spot is no new discovery of mine. The Phantom Gourmet wrote a blurb about the place as well. Take their word for it (or mine), Christina's is absolutely worth a visit. On my most recent trip to London (and by recent, I mean within the past 12 months...) I had an early morning stopover in Iceland. At 4.40am Icelandic time there's not *too* much to see at the small Reykjavik terminal except for the occasional tall, thin model-worthy Icelandic blonde passing through or the small (but surprisingly rowdy at 4.40am) crowd of British rugby players on stopover to Dublin oggling said tall, thin model-worthy Icelandic blondes. Thanks to the presence of a small airport shop, in addition to confirming my distaste for obnoxious rugby players, I managed to confirm my appreciation for Icelandic food. 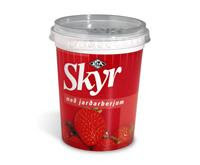 While snarfing up spoonfuls of the deliciously creamy skyr, I wondered just how many kronas (ISK) there are to the U.S. dollar. A recent article in Daily Candy pointed out that Icelandic food is on the rise in Boston. So no need to spend the early hours of the morning tuning out British raucousness or enviously staring at the incredibly blonde blondness of the local fauna. One can just stop over at the nearest Whole Foods for your fill of smjör, Hofdingi and Stóri Dímon. Why not pick up a bar of Nói Síríus chocolate while you're at it. p.s. While surfing the web in search of images of Nói Síríus chocolate, I came upon this gem of a blog, GastroShark! One of my favorite (if slightly overdone) lounge bars in the area is Om, right here in Harvard Square. On weeknights, the 5-for-5 deal is quite good, plus the smaller crowds allow for more one-on-one time with the bartender. On a particular Wednesday night we spent the early evening grilling the poor man about how he blends each cocktail. Apparently they make their own simple syrup and always use fresh fruit for all their mixes. Be forewarned, on weekends this place becomes a pounding night club minus the dancing. You'll have to shout across the table to hear your date, so take your drinks out to the small beer garden in back or just have dinner on the sidewalk patio instead. Well, ok, maybe not a degree IN FroYo, but one of the newest, cutest frozen dessert spots in Harvard Square is run by a couple of guys with PhDs...in biology and biochemistry that is. ...open from 9am-11pm on weekdays and until midnight on weekends, this bright little spot in Harvard Square will have a line out the door most evenings. What draws in the locals from across the street, the college kids from across the yard and this particular graduate student from across the Square? The FROYO. It's...AMAZING. Rich, creamy and tasting an awful lot like yogurt, it's topped with the freshest blackberries, strawberries or peaches along with any assortment of cracker, cookie or cereal crumbles (fruity pebbles is one option!) Possibly the most impressive feat is the ability of the co-owners to put in full days at the lab and then spend their entire evenings serving FroYo to happy customers. If these guys had opened in June they would have made a killing over the summer. Let's hope they survive the winter because when it comes to FroYo, these guys more than make the grade. She in turn had picked out a couple of my personal favorites from my own inventory. It's always kind of sad to let go of the things I make, but it makes me happy to know that people appreciate handmade and unique items. I know I do! 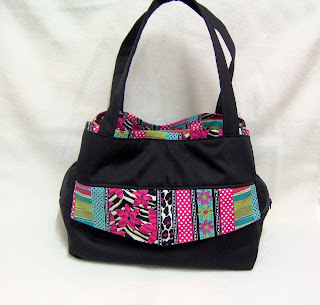 MissGywneth is a 22 year old mother of 2 who loves making purses, clothes and baby clothes. Check out her shop on etsy!